The Heritage Premier show glove is the most popular glove designed for showing competition. Exclusively made with a new technically advanced material that insures a tacky grip on the reins and allow moisture to pass through from your skin to the surface creating a more comfortable riding experience while competing in your event. The Heritage Premier Show glove offers a comfortable custom fit with Heritage Gloves stretchable flex panel across your knuckles and adjustable strap closure. The Heritage Premier show glove is also made with exclusive Heritage breathable "Super Grip" synthetic grain leather, which helps to increase your sensitivity control and grip of the reins. "Super Grip" is designed to be breathable and permeate the perspiration from your skin out at the same time it is maintaining a perfect grip. This special material is also machine washable. The fingers and thumb are fully ventilated with holes to allow perspiration out and fresh air in. All critical outward seams are double stitched to extend the life of the glove. 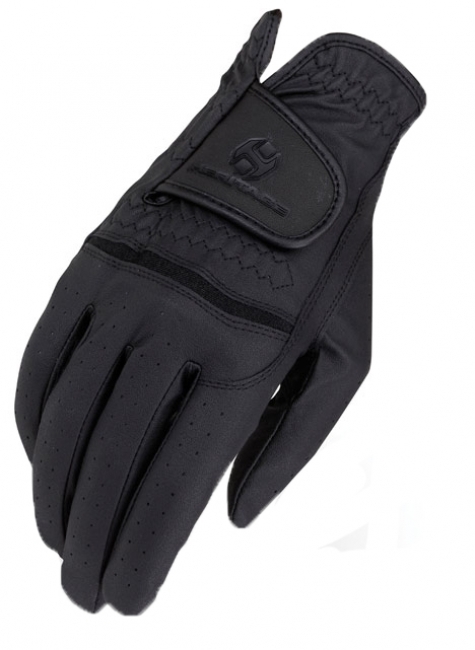 The Heritage Premier show gloves perform well for Showing, Jumping, Dressage, and Eventing. Heritage Gloves are the Official Riding Gloves of the United States Equestrian Federation.